Published: May 22, 2013 at 11:17 a.m. 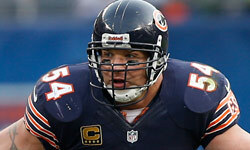 Updated: May 22, 2013 at 06:44 p.m.
One of the greatest Chicago Bears of all time will not put on another team's uniform. Brian Urlacher announced his retirement Wednesday on Twitter. » Debate: Is Urlacher a lock for Hall of Fame? "After spending a lot of time this spring thinking about my NFL future, I have made a decision to retire," he wrote in a statement. "Although I could continue playing, I'm not sure I would bring a level of performance or passion that's up to my standards. When considering this, along with the fact that that I could retire after a 13-year career wearing only one jersey for such a storied franchise, my decision became pretty clear." Urlacher's foot speed rapidly diminished in 2012 because of a knee injury, and he struggled to find interested suitors in free agency this offseason after he couldn't come to terms on a new contract with the Bears. Urlacher was only one season removed from a resurgent 2011 campaign, but the end often comes quickly in the NFL, even for an eight-time Pro Bowl selection. Urlacher entered the NFL as an immediate star, racking up eight sacks as the 2000 NFL Defensive Rookie of the Year. He won the 2005 NFL Defensive Player of the Year award and was the key player during a dominant stretch for former Bears coach Lovie Smith's defense. Urlacher made four first-team All-Pro teams, a sign of a player at the very top of the game. "I'm proud to say I gave all of you everything I had every time I took the field," Urlacher wrote in the statement. "I will miss the game, but I leave it with no regrets." It's somehow appropriate to see Urlacher retire in the same year as Ray Lewis. Even though they had different styles, Urlacher was in many ways the defining middle linebacker in the NFC for a decade, with Lewis in the AFC. While Lewis surely is much higher on the "all-time greats" list, Urlacher helped redefine the game as the classic Tampa 2 middle linebacker. A former college safety at New Mexico, Urlacher's ability to rack up tackles while covering tight ends deep down the field was breathtaking. Lewis' and Urlacher's careers diverged in many ways, especially at the end, but they should land in Canton together five years from now.